On the banks of the Douro, Porto is a colorful city teeming with life, history, and culture. Take in Porto’s riverside charms and many churches, palaces, gardens, and museums. And beyond Porto, white sand beaches, medieval towns, fishing villages, and scenic park land await. The rolling hills and terraced vineyards of the Douro River valley round out the region’s beauty. Stay in a comfortable private vacation apartment in an the charming city center. Day trip options: Douro River Valley, Aveiro and the Costa Nova, Braga, Coimbra, Viana do Castelo, Peneda-Gerês National Park, Vigo (northern Spain) and more. Day trips: Just a few of the day trips in northern Portugal include Aveiro, Viana do Castelo, and Vigo. Visit historic towns of Viana do Castelo, Braga, Coimbra, Guimarães and the vineyards of the Douro River valley. Peneda-Gerês National Park is accessible by car or with a day tour from Porto. 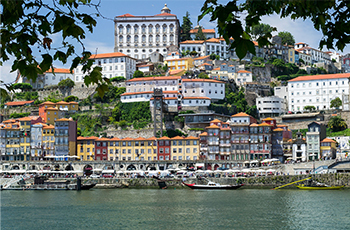 Sightseeing: Sample the local Port wine in and around Porto, and cruise the river. Venture deeper into the Douro River Valley for vineyards and scenery. Explore beautiful Medieval cities like Braga and Guimarães, where you can stroll the atmospheric labyrinth of their ancient core. See Portugal’s oldest university and the intricate layers of history in lovely Coimbra. Or board a colorful boat and explore the canals of lovely Aveiro, the Venice of Portugal. Off-the-beaten-track treasures that can’t be beat: In Porto, hang out in the hip setting of Foz do Douro with a seaside view and a glimpse of the old lighthouse. Or visit one of the world’s most beautiful bookshops. Explore the white sands of lesser known beach towns like Espinho. Explore convents,Roman ruins, and sanctuaries in the countryside. Within the wilderness of Peneda-Gerês National Park with high land hiking, and discover tiny archaic villages throughout the park that appear frozen in time. And venture out into the Douro Alto to visit vintners and sample wines in the sunny terraced vineyards that have been cultivated for millennia. Join pilgrims walking along one of the Camino de Santiago trails that passes through Porto and north toward Spain. Visit Ponte de Lima, the oldest town in Portugal. Or head north into the border towns of northern Spain. A local transit pass that also offers free and reduced admission to Porto attractions. An orientation session with local staff to help you make the most of your time. A cultural event that gives you local insight into the culture. "We were blessed with 70 degree weather, so the apartment was comfortable, even the bedroom without a window. Climbing those cobblestone hills ALL the time was a surprise, but having the weather moderate helped with that. Overall take away: the Portuguese people were so cordial!" I really liked Portugal a lot-- such friendly and helpful people especially in Porto. Enjoyed walking around the various neighborhoods and going to special sites. Portugal is a charming country from what we experienced with very friendly people and a rich history and pride in earlier explorations of world by ship. Museums and churches are beautiful and enjoyed seeing their artwork and culture.